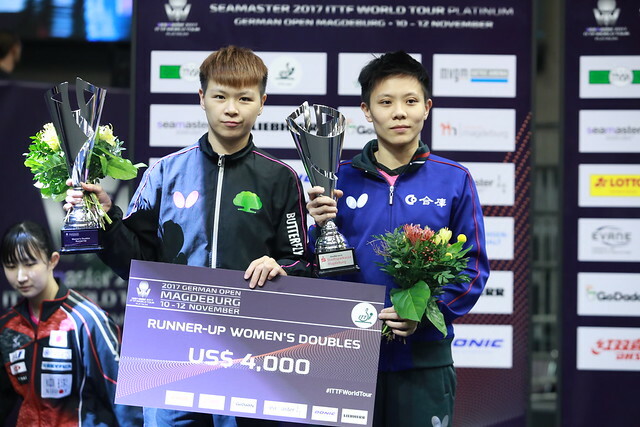 The morning belonged to Hungary; on Wednesday 8th November of that fact there was no doubt; Bence Majoros and Nandor Ecseki caused the biggest upsets as the leading names in the qualification tournament for the Seamaster 2017 ITTF World Tour Platinum German Open in Magdeburg entered the arena. Not only did they cause upsets; unbeaten the previous day the wins meant both concluded their group phase matches in first place. Presently listed at no.210 on the Men’s World Rankings, Bence Majoros beat Nigeria’s Quadri Aruna (6-11, 11-5, 13-11, 3-11, 11-2, 11-8) named at no.27 in the global order and the recent winner at the 2017 ITTF Challenge Polish Open. One hour later, Nandor Ecseki followed suit, standing at no.233 in the world rankings, he accounted for Gao Ning who occupies the no.43 spot. Furthermore, Gao Ning has enjoyed notable success on the ITTF World Tour, in 2007 he won in India, in 2012 in Chile. First place in the group assured, it was the same for China’s Yu Ziyang and Zhou Kai; likewise unbeaten the previous day, Yu Ziyang completed his first phase qualification tournament itinerary by beating Japan’s Kenta Tazoe (11-6, 11-4, 11-8, 11-8), Zhou Kai accounted for Korea’s Kim Donghyun (11-1, 12-10, 11-6, 9-11, 10-12, 11-9), the winner at the recently concluded 2017 ITTF Challenge Belgium Open. Neither Yu Ziyang nor Zhou Kai possess a current World Ranking; it is the same for Kim Donghyun but in October he was named at no.80; Kenta Tazoe is listed at no.73. Defeat for four celebrated names, the highest rated players in their respective groups, the end of the road. Similarly, there was defeat for Slovakia’s Wang Yang but for him the door is not yet closed. Occupying the no.66 spot on the current Men’s World Rankings, he was beaten by the host nation’s Nils Hohmeier, named at no.480, in six games (13-11, 6-11, 11-8, 4-11, 11-9, 11-8). However, the previous day, Nils Hohmeier has experienced defeat in four straight games when facing the Czech Republic’s Tomas Konecny, ranked no.101 (11-8, 11-4, 11-6, 11-2). In order to secure first place in the group Wang Yang must beat Tomas Konecny in four straight games. Problems for players who started the group phase of the qualification tournament as the top name in their respective groups; for the leading names on duty there were no such problems in their opening encounters. Similarly, Sweden’s Kristian Karlsson overcame Hungary’s Adam Szudi, Germany’s Ruwen Filus (11-2, 11-3, 9-11, 11-9, 11-7) defeated Chinese Taipei’s Yang Heng-Wei (11-2, 11-3, 9-11, 11-9, 11-7).